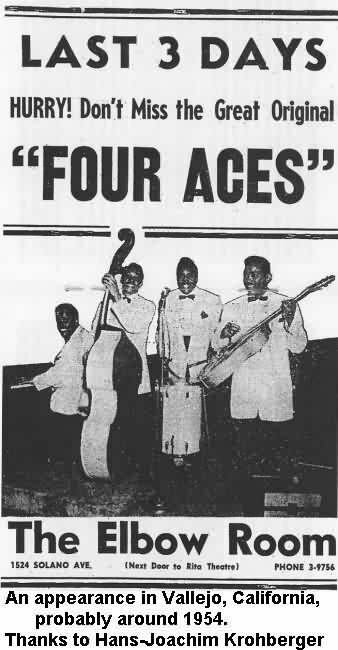 The 4 Aces name has been associated, over the years, with 1950s Pop music. This is due to the hits of Al Alberts and the 4 Aces (such as "Sin," "Perfidia," and "Three Coins In The Fountain"). 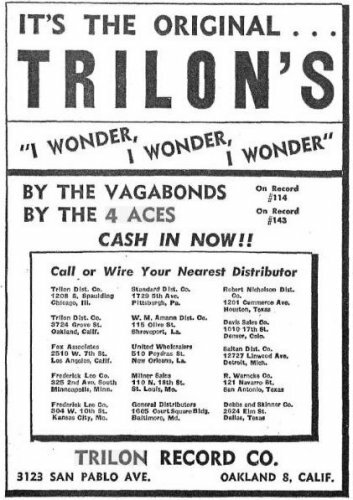 But before Al Alberts, there was another 4 Aces group, an R&B group that recorded for Trilon and 4-Star in the 1940s. Just to get it out of the way, there were at least two other 4 Aces groups. The first recorded "Rhythm Is Our Business"/"New Jig Rhythm" for the Champion label in 1933. The 4 Aces that are the subject of this article formed in 1935 at the I.M. Terrell High School in Fort Worth, Texas. Second tenor Algia Pickett (pronounced al'gee) originally sang with a group called the Futuristic Four, but the other members graduated before he did. 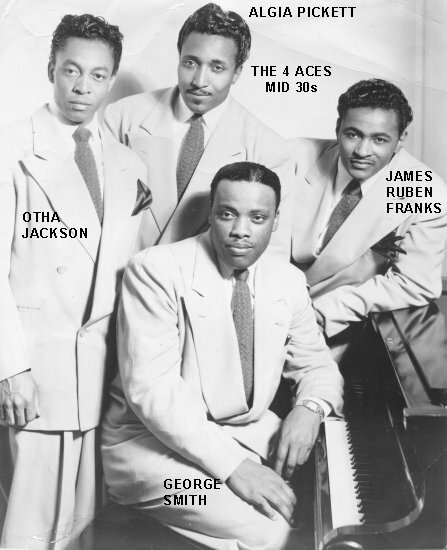 He then teamed up with James Ruben Franks (first tenor and guitar), George Smith (baritone), and Otha Jackson (bass) to form another group. Algia originally had to quit high school because of family responsibilities, but he subsequently returned to get his diploma. He was thus older than the others, turning 22 in 1935. That same year, Otha was 19, James was 18, and George was 17. They practiced a close harmony (Barbershop) style and sang at churches and Kiwanis Clubs. "We sang spirituals and popular tunes," says Algia, "and they'd kick in $5 or $10." They also sang "vocal instrumentation," like the Mills Brothers. One of their favorite arrangements was "My Wild Irish Rose." Finally, they attracted the attention of a local radio station and got a sustaining (non-sponsored) show for 15 minutes a week. Up to this point they had no name, and the announcer at the station, a Mr. Gallagher, was the one who dubbed them the "4 Aces," a name he seems to have just made up on the spot. The program was supposed to have lasted for three months, but it was extended for another two or three. After that, they opened up the Texas State Network (along with singing cowboy Gene Autry). By the time they went with the Beckman And Garrity Show on the "Sawdust Trail" throughout the North around 1938, baritone George Smith had started playing piano for them. He then taught Otha Jackson to play the bass. Now, with guitar, piano and bass, they were a self-contained unit. 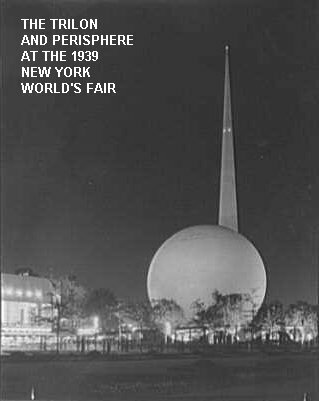 When they returned to Texas in 1939, they got another sustaining program, this time on WOAI in San Antonio, Texas. It lasted about a year. 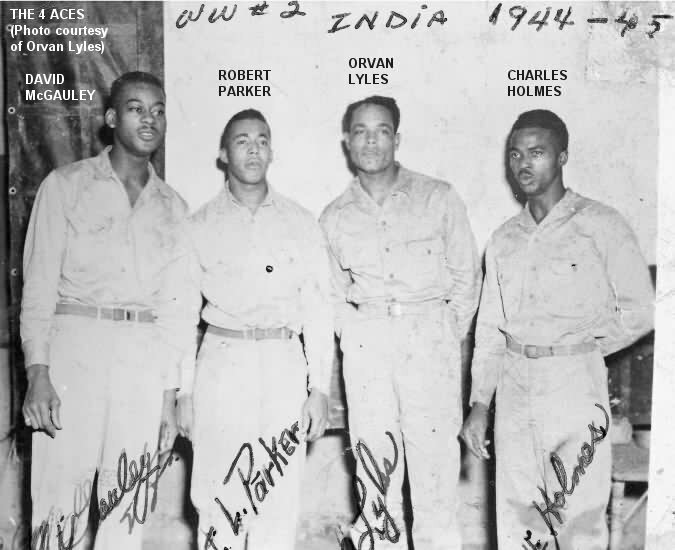 By the eve of World War 2, the guys saw limited potential for a vocal group in Texas and decided to move to the San Francisco-Oakland area. When war finally broke out, Algia, Otha, and George went into the service. Ruben (they don't seem to have called him "James") was the only one who wasn't in the military, and he spent the war years singing with various local bands. In January 1946, Algia was discharged and moved into the house that Ruben had in Oakland. When Otha and George got out, the 4 Aces were re-formed. 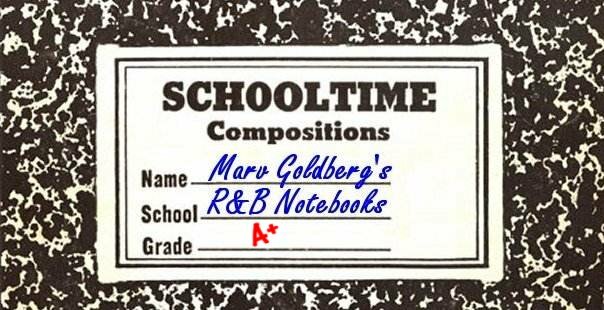 They all attended the Kendell Conservatory of Music in Oakland, in order to learn how to arrange their music. At the same time, they were playing San Francisco niteclubs in the evenings. So as not to be left out musically, Algia started playing a cocktail drum with brushes. At their first session, they recorded six sides: "I Wonder, I Wonder, I Wonder" (both instrumental and vocal versions), the deliciously raunchy "Garbage Man" (led by George), "Put Your Cards On The Table" (James), "There's A Rumor Going Around" (Algia), and the instrumental "St. Louis Boogie." On the instrumental version of "I Wonder, I Wonder, I Wonder," as well as on "St. Louis Boogie," they were joined by Benny Butler on organ. (As a matter of fact, "St. Louis Boogie" was credited to "Benny Butler, with Ensemble of 4"). All six tunes were released, on three singles, in December 1946, but failed to chart. Meanwhile, they kept on playing local niteclubs. 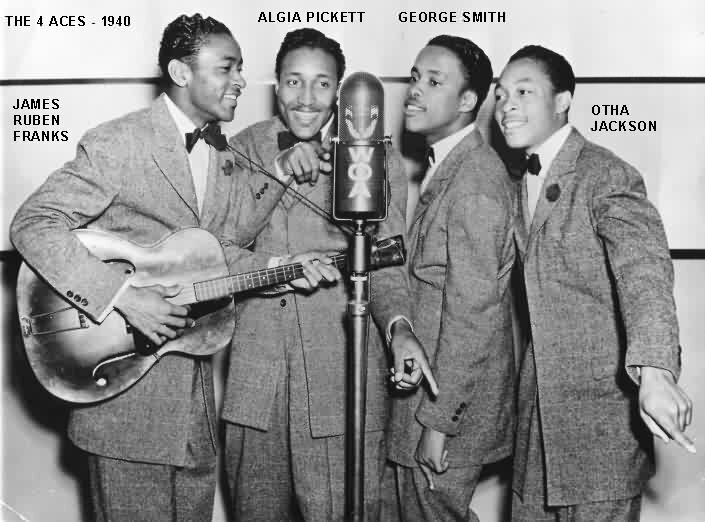 There was a second session around March 1947, at which they recorded two more sides: "Richard Ain't Gonna Open That Door" (led by George), and the instrumental "Richard's Jam," with extra musicians Jack Harris on drums and J.P. Patterson on saxophone. They were released soon after, with the same lack of success. While there were many covers of "Open The Door Richard" (first recorded by Jack McVea), "Richard Ain't Gonna Open That Door" tells the story from Richard's point of view. The last Trilon session was held in mid-1947, at which time another six songs were recorded: "Cherie" (led by James - this is "Cherry," which Harry James had made a big hit back in 1942), "I'll Never Let You Go Again" (Algia), "I'm Crying All The Time" (James), "This Little Chick Went To Market" (George), "Ain't It A Cryin' Shame" (George), and "Gumbo" (George). Once again, all six sides were released in the same month (July 1947). While the records never became chart hits, the 4 Aces got a lot of work. They continued to live in Oakland, but travelled for two or four weeks at a time to Los Angeles, Washington, Oregon, and even Canada. For a while they were managed by Hal Morris, who was the brother of singer Tony Martin. In early 1949, while they were playing a club on Los Angeles' Sunset Strip, they were approached by someone from William McCall's 4-Star record company (located at 305 South Fair Oaks Avenue in Pasadena). The meeting might not have been accidental, since Bob Geddins was now an a&r man for 4-Star. The first session for 4-Star yielded at least eight tunes: "Till I Go Dreaming Of You" (led by James) "Lazy Navajo," "Aces Swing," "Too Late" (Algia), "Jumpin' Out" (James), "Who Is There To Blame" (Otha), "Because I'm In Love With You" (Algia), and "Katie May" (George). "Lazy Navajo" and "Aces Swing" were released in April of 1949, but fared no better than the Trilon sides. Later that year, "Too Late" and "Jumpin' Out" were issued. The third, and last, 4-Star single was "Who Is There To Blame," backed with "Because I'm In Love With You," which came out in January of 1950. A month or two later, there was an ET put out by 4-Star. 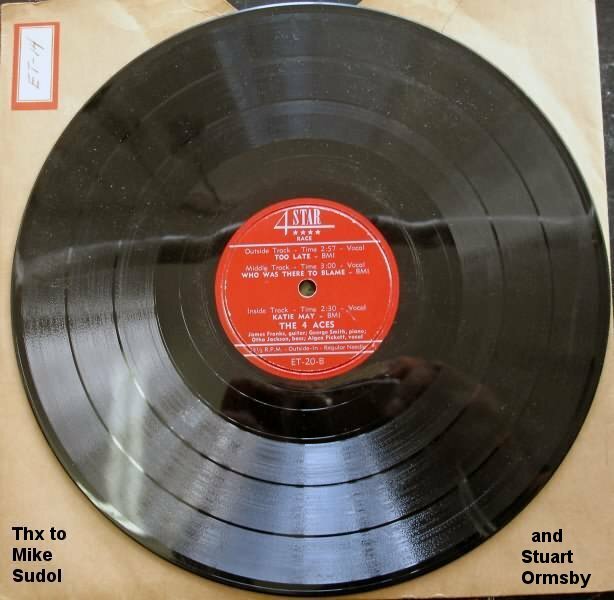 This was a 16-inch Electronic Transcription disc (with instructions to play it from the inside toward the outside) that was meant for radio play only. It contained 6 songs: "Till I Go Dreaming Of You," "Lazy Navajo," "Aces Swing," "Too Late," "Who Was There To Blame" (note the slight change in the title), and "Katie May"
There was one more session, at which at least four songs were recorded: "Release Me" (led by James), "Whose Arms Are You Missing" (led by Algia), "I Can See An Angel" (Algia), and "You Were My First Affair" (led by Otha). "Release Me," which had been a hillbilly tune, is the same song that Englebert Humperdinck made into a hit in 1967. None of these tunes was issued at the time. While the 4 Aces never had any hit records, up till now, they'd had 22 sides on wax. However, once Al Alberts and the 4 Aces started having hits, that was it for the guys; they never again recorded. 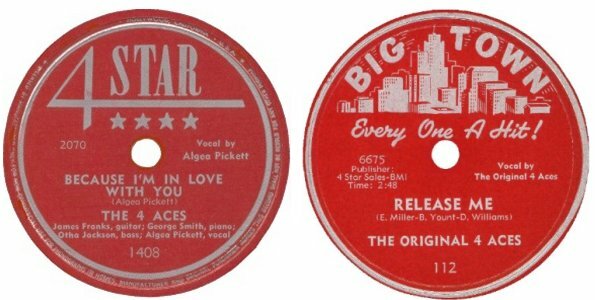 In May 1953, 4-Star purchased Bob Geddins' Big Town Records. They celebrated by releasing a 16-inch ET (electronic transcription) disc on Big Town, featuring several artists on each side. 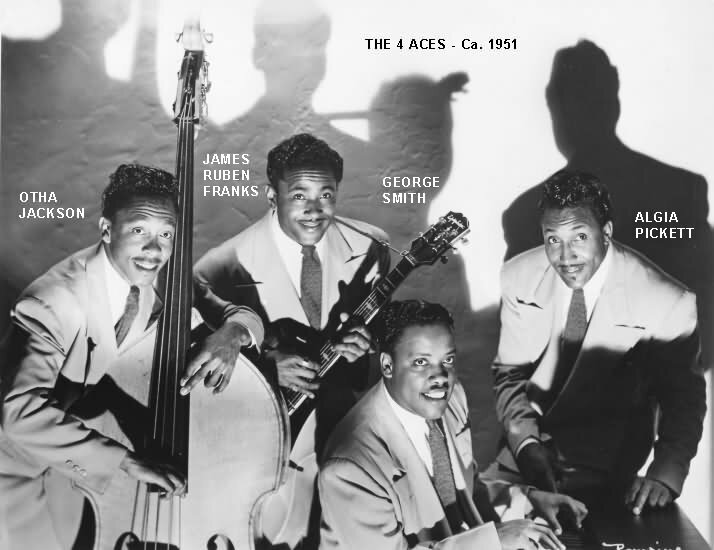 The Four Aces were represented by their old 4-Star recordings, "Release Me" and "I Can See An Angel." Then, "Release Me" and "Whose Arms Are You Missing" came out on Big Town in 1954. With the "4 Aces" name having been appropriated, the label proudly announced the tunes were by the "Original 4 Aces." The same was true of the last two tunes, "I Can See An Angel" and "You Were My First Affair," which were released in February 1955. While the trades ranked both sides "poor" in April 1955, you have to remember that these tunes were probably five years old at the time and completely out of sync with the Rock & Roll explosion that was going on. The trades didn't rate a song on how good it was, but on its potential to make money. The last appearance on record of the 4 Aces was an odd one. 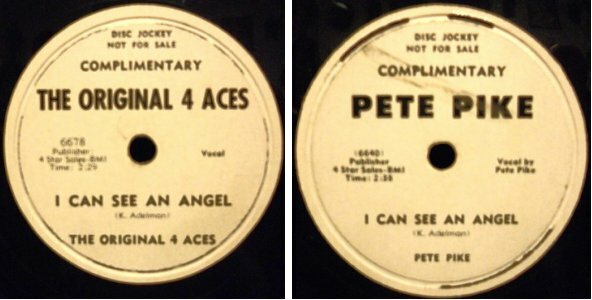 Sometime not long after the release of "I Can See An Angel," it was paired with a version by Bluegrass singer Pete Pike that had come out, on Coral, in October 1954. There was no company name or record number on the label, but the sides seemingly have Big Town master numbers (and both claimed publication by 4 Star Sales, BMI). The 4 Aces struggled on, but in April 1956 James Franks left and moved to Los Angeles (where he would open a combination pool hall and store). He had gotten disenchanted because he didn't feel that the group was getting the money that they deserved on their tours. The guys went on a final tour of Washington, Oregon and Canada with a pick-up guitarist. But it just wasn't the same. George Smith got disenchanted also, and left to work for the Post Office in San Francisco, where he still lives. Otha did a tour with the Coasters and Pee Wee & Sugar Pie, as a backup bassist and also formed a little group that played fraternity parties at the University of California; he then went to work for the Post Office too. Algia went to work for Alemeda County, and that was the end of the 4 Aces. The original 4 Aces are all gone now. George Smith died before 1998. Algia Pickett passed away on April 11, 2004 (he was around 91), followed a few months later (November 1) by Otha Jackson (88). I don't have a date for James Franks' death. 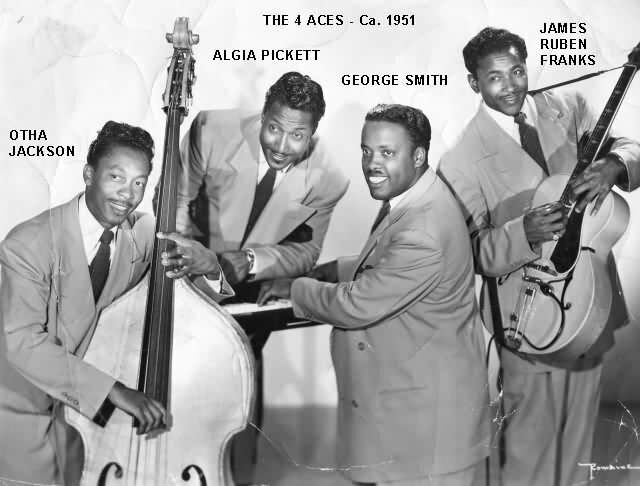 The 4 Aces were one of the many transitional groups that took small-combo R&B into the 1950s. Possibly things would have been different for them had the white 4 Aces not come along, but probably not. 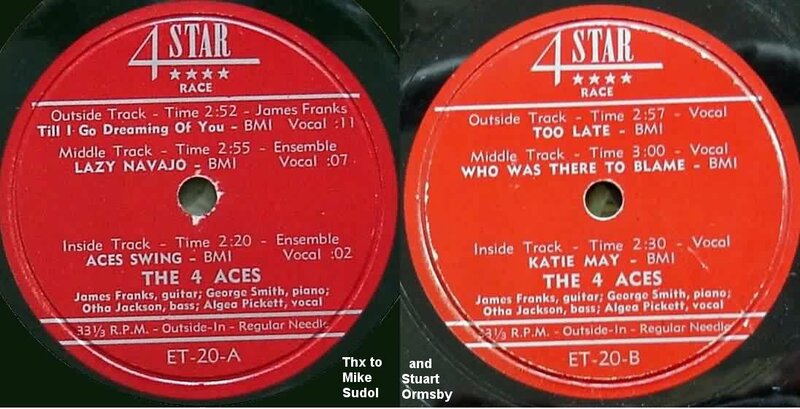 There were many, many of these small combos, some of which recorded, but almost completely without success (the only outstanding exceptions were the King Cole Trio and Johnny Moore's Three Blazers). However, they did manage to remain together for over 10 years (16, if you count the pre-war days), which is a tribute to their talent.